For Bright Week only, Paschal period, all the time since now? Why do the Romanians have their Patriarch wear all white? Is this solely a Romanian thing? 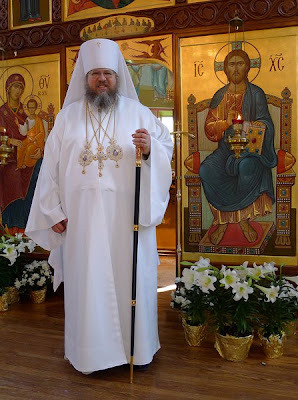 I have never heard of another one Bishop but the Romanian Patriarch (and, as we can see, Metropolitan Jonah) that wears white ryasa. I actually do not know why more don't white (or even other colors). I know that some priests, bishops and abbots wear white. Every Priest (and Bishop) is supposed to switch to white from Pascha until Pentecost. Officially the vestment change is made on Holy Saturday morning. After Pentecost it goes back to normal. I know no one that has a white cassock. Yes, but it is not liturgical vestments that are under discussion here, but rather clerical street garb, specifically Metropolitan Jonah`s. Light-colored, especially white, exorasa fell out of general use about 200 years ago. I've read, although not seen it confirmed, that the Turks used to force Orthodox priests to wear white instead of black. That way the Muslim clerics would look crisp in their black robes and the Christians would look dirty. Anyway, the Slavs adopted the practice of wearing white, and, true to form, the Russians in particular turned it into a very stratified system that corresponded to the clerical caste structure. You could tell a clergyman's rank and office by the color and marking on his podriasnik and riassa. Different color combinations, including different types of lining on each, meant different things. This produced the famous distinction between "black" (i.e. monastic) and "white" (i.e. parish) clergy, which persisted in the Russian tradition until fairly recently, and included other distinctive markers (e.g. "white" clergy wore goatees, not beards). Fr Schmemann used to wear a white cassock and, in general, comported himself like a white clergyman should according to the pre-Revolutionary standards. Metropolitan Jonah's riassa, however, looks to be of very inferior quality. Not at all as dignified as those worn by the Patriarch of Romania. I didn't realize it was a riassa/cassock, I figured it was just Liturgical vestments (I didn't look at the photo that closely). Still, maybe he has decided to do so just until Pentecost? I've seen tan ones in the Middle East and in Africa. In Greece, especially various islands, it is not uncommon to wear blue. And, yes, gray pops up here and there. I wonder if the Russians of 200 years or so ago were impressed by the use of colors for clerical ranking in the Roman Church? I believe that before the revolution, ryassas used to be in different colours, however since then they almost always (with this exception) black. Podrazniks (the under cassock) are still commonly available in other colours. I know a priest who wears a white cassock on Pascha (and only on Pascha). It's rather striking in combination with the white vestments. Sometimes clergy have a white cassock, and possibly a white riassa too, for Bright Week. Some wear it until Ascension or Pentecost. I know Fr. Alexander Schmemann was fond of wearing a white cassock at other times of the year, too. I like the picture. Metropolitan Jonah looks very nice. The Cross he's wearing... those are the gift Crosses the Patriarch of Jerusalem gives to visiting Orthodox clergy. You can also buy them for about $10 USD in any of the Christian stores in Jerusalem. Many Ukrainian and Russian Orthodox clergy wear white cassocks during bright week and the Sundays of the Paschal season. I know a priest who does. It looks quite nice during the Paschal season.